Venezuelan President Nicolás Maduro. Photo by PDVSA. 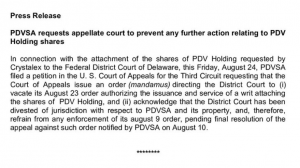 State-owned Petróleos de Venezuela SA or PDVSA announced on Twitter that it filed an appeal requesting that a Delaware court vacate a decision made public on August 23 granting Canadian miner Crystallex the right to seize its U.S. assets. The petition refers to a decision made on August 9, 2018, by U.S. District Judge Leonard Stark in the eastern U.S. state. Stark approved a request by Crystallex to attach shares in PDV Holdings, a U.S. subsidiary of PDVSA that indirectly controls refiner Citgo. Citgo owns three refineries in Louisiana, Texas and Illinois, as well as other assets that have been valued between $8 billion and $10 billion. With this move, Crystallex is aiming at collecting a $1.4-billion-award in compensation following a decade-long dispute over Venezuela’s 2008 nationalization of its gold mine in the southern Bolívar state. The amount is comprised of $1.2 billion plus $200 million of interest awarded by a World Bank arbitration tribunal in 2016. If PDVSA’s appeal does not proceed, the Nicolás Maduro government could be forced to comply to Crystallex’s demands. 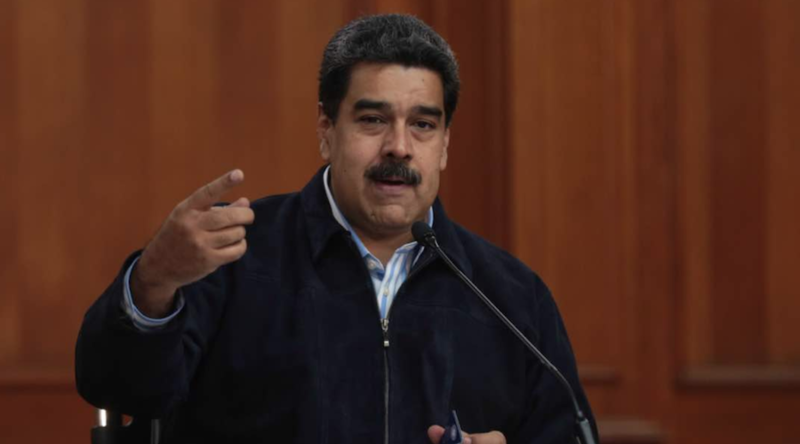 The Canadian firm has accused the Nicolás Maduro government of performing “fraudulent transfers” to avoid paying what it owes. Among those transactions, Crystallex has cited the payment of dividends from PDV Holding to PDVSA for $2.2 billion and the issuance of 49.9% of Citgo’s shares to secure a $1.5 billion loan granted by Russian giant Rosneft in 2016. A lawsuit introduced by the miner against such asset transfers by Citgo was initially dismissed in January 2018, but the Toronto-based company requested a new hearing. In November 2017, Crystallex and Venezuela agreed to settle the dispute before Ontario Superior Court Justice Glenn Hainey. However, the deal did not resolve the fight over the $1.2 billion award because the cash-strapped South American country did not honour its payments. With files from Reuters, Bloomberg, El Universal.